Author: Jean-Claude Naba. Series edited by: Wilhelm J.G. Möhlig, Bernd Heine. 18 pp. Roman, 398 pp. Gulmancema is the mother tongue of 100,000 to 500,000 people in Western Africa (Burkina-Faso, Benin, and Togo). It belongs to the family of Gur languages, a branch of the Niger-Congo languages. This classical structuralist grammar starts with an introduction to the language policy of Burkina Faso and the alphabetization projects for Gulmancema. 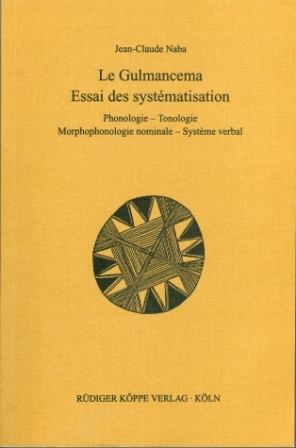 It is followed by an extensive description of Gulmancema’s basic phonological and morphological elements and its nominal and verbal system and also contains numerous language examples and tonal patterns. Please find the complete review text by Norbert Nikièma following the link at the bottom. Au plan des applications pratiques: Naba a au tout début comme à la fin de son travail exprimé sa préoccupation pour les applications pratiques et l’utilisation des langues nationales, notamment dans le système éducatif. Son travail offre de bonnes bases pour la recherche de solutions aux problèmes pendants, notamment ceux rélatifs à la notation orthographique du gulmancema.